The first major version of Redactor was released back in June 2013, when we introduced modmore to the world. Since then your heartfelt reviews and purchases of our premium extras have enabled us to build more extras and even host an event. We have no plans of slowing down. With that said, it gives me great pleasure to share with you a new major version of awesome: Redactor 2.0. And best of all, Redactor 2 is a free upgrade! If you're eager to try it out, any sites with valid Redactor licenses should now see the 2.0.0 update. We first recommend reading the upgrade notes which includes information about changed or depreciated features. For more details, keep reading, or check out the changelog and documentation. On September 24, 2014 Imperavi, the authors of Redactor.js, released Redactor 10.0 and we immediately began work on Redactor 2.0. 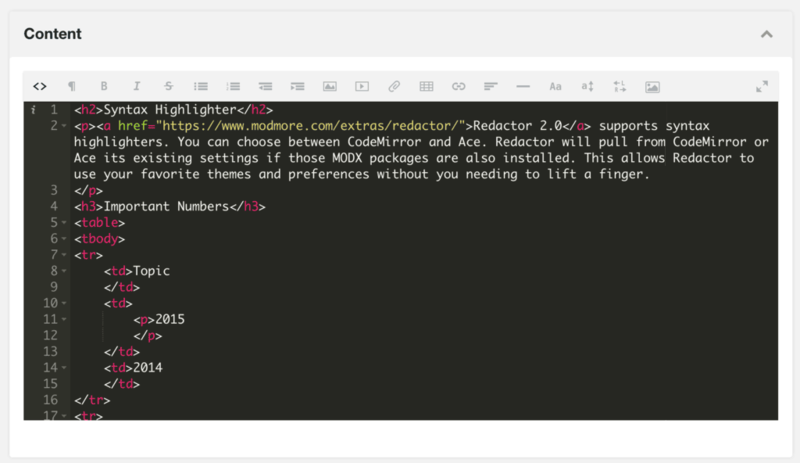 After months of hard work, we're finally ready to announce our second major version of Redactor for MODX. I’m very excited to share this release with you and can’t wait to hear what you have to say. Let’s have a look at the highlights. Redactor 2.0 now supports CodeMirror or Ace for syntax highlighting. If the associated packages are installed, Redactor will use your existing settings. Or, since source mode might not be required for some users, you can prevent them viewing the source altogether. Settings like theme and fontSize can be configured on the user level so it’s easy to increase the font size or use a high contrast theme for particular users. Redactor 1.x used a simple media browser that didn't scale very well. We've created an all new media browser with improved performance and user experience. This is a new open-source component called Eureka. 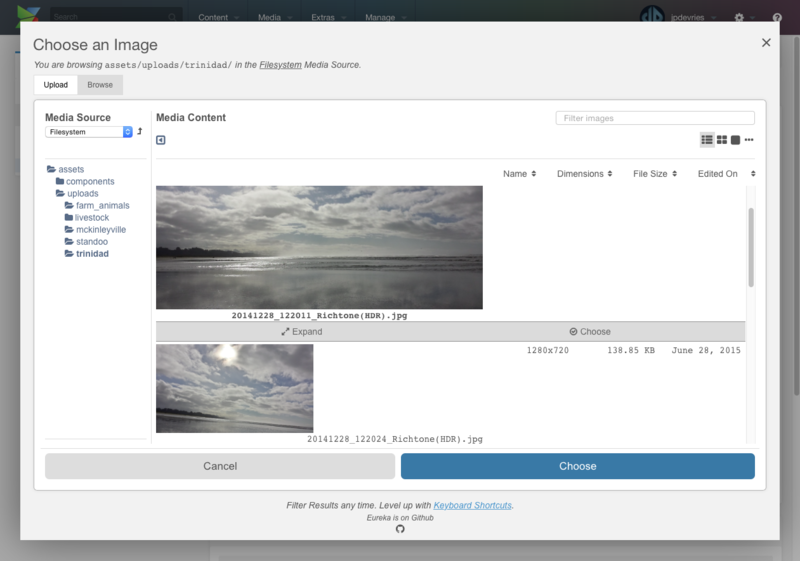 We've kept the simple upload window that allows one or more files to be uploaded to a predefined location. Some of our power users want more control over where that file or image they are uploading is going, so we created a setting for that. By enabling the redactor.eurekaUpload system setting, you'll find the ability to upload to any directory within available media sources, and even create new directories, in the enhanced browse & upload tab. With Redactor 2.0, all our 150 or so settings are now context aware, meaning that they can be overridden on a context level. It’s now trivial to do things like upload images to different locations based on the current context, or to enable/disable specific plugins for specific contexts. When upgrading to Redactor 2.0, you’ll have several new plugins at your disposal. It now ships with a total of 22 plugins that can be enabled or disabling with a simple yes/no setting. 13 of these plugins are brand new and authored by yours truly. Many of them contain new features that have been requested through support, so we can’t wait to hear what you have to say. Let's have a look at what these new plugins can do. To use these, you'll need to first enable them in system settings. Had enough yet? We haven't, as there are even more new features in Redactor 2.0 that we'd love you to try. With the Redactor v10 core more extensible than ever, we were able to abstract the majority of our modifications to standalone plugins. Aside from making it easier for us to stay up to date with Imperavi's releases, this means we can also share our work with others using Redactor. We've open-sourced these plugins on Github for others to use on Redactor projects and hope you will find it useful. The new media browser used in Redactor 2.0 is on Github as well. These plugins are free to use and we hope Redactor users in or outside the MODX community will find them useful. Who knows, checking out how we authored our plugins may even give you inspiration to author one of your own or to improve ours! We've put a lot of effort into making Redactor 2.0 the best rich text editor possible. Despite that, Redactor 2.0 will be a free upgrade for all users. Aside from all the new features, Redactor 2 also fixes a lot of bugs and we wanted everyone to benefit from that. All your sites with valid Redactor licenses should now see 2.0.0 as an update (let us know if they don't). We've prepared an upgrading from 1.x to 2.0 doc containing information about changed or deprecated features from 1.x and how to deal with those, so we recommend checking that out before upgrading your live sites. We hope you like the update! Prefer getting all blog posts via RSS? You can find the feed here. Our biggest announcements are posted right here, on the blog. More frequent announcements and updates from the team can be found on our forum.